Running your own web server is easier than you may think and its cost effective way for you or your company to establish a web. To Set Up Web Servers just follow the steps. We’ll add TCP, UDP Port 80 in the Windows Firewall, To allow HTTP access. 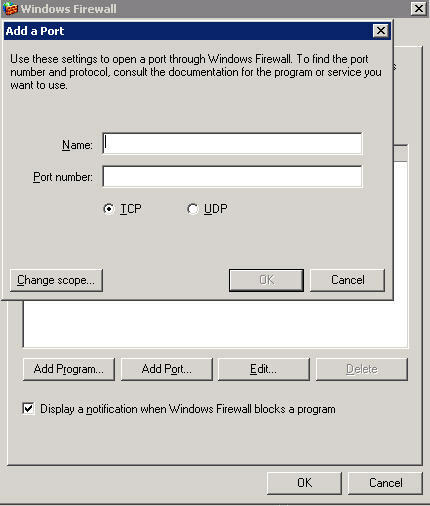 Go to Control Panel -> Windows Firewall , double click on Windows firewall icon . 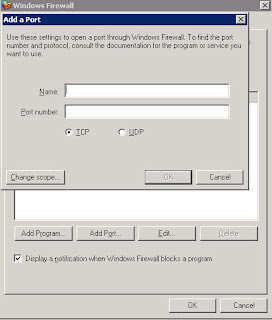 In Windows Server, click on Allow a Program through windows firewall. Again Click on Add Port Enter Port name HTTP UDP, Enter Port Number 80, Select UDP and press OK.
Windows 7 user can follow these instrucions. Windows Firewall with Advance Security will appear, Click on Inbound Rulesfrom the left side. Now add a new rule by clicking on Add Rule . New Inbound Rule Wizard will start, Select Port and Click on Next button. Now, Check Domain, Private, Public, so you can access web server within network and also over internet. The last thing in the first step is to name the Rule, you can give any name to it. I’ve given the name HTTP to this rule. Now select Port, and click Next, In the next step Select UDP and Enter 80 in the text box. Now, follow the same steps but give this rule some different name. like I’ve given HTTP_UDP, and click on finish button. Now we’ve add exception for port 80 in windows firewall. We’ve completed first step. Now we’ll configure router to forward port 80 when access over internet. Port forwarding steps can be different for different modems and routers. If you don’t know how to configure your router for port forwarding. Visit http://portforward.com/ , select your modem/router and follow the steps to configure your modem/router. In the Advance Setting, Click on NAT, select your virtual circuit on which your connection is configured. and click on Virtual Server. Now, to check your local ip, open command prompt ( Start -> Run, enter cmd and press enter). write ipconfig and press enter. Now note your local ip. In my case its 192.168.1.8 as highlighted in the pic. Now, open your browser again, write application name, any name can be given, select All from protocol, enter 80 in start port, enter 80 in the end port number, enter your local ip. which you’ve noted in the previous step, and click on save button at the bottom. Now, you’ve configured your router/modem to forward port. Open check your global IP. to check your IP Open http://ipchicken.com/ and note your IP. Now copy your IP and enter into your browser. You can install apache server or wamp server, Xampp server also . You can run your own web server for your website.